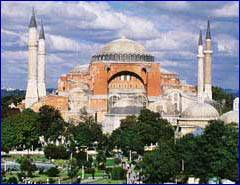 08:305 am Pick up from your hotel in Istanbul and the tour follows, Haghia-Sophia : The magnificent Byzantine Church of all times; one of the finest and largest architectural works of art in the world. Blue Mosque : One of the biggest mosques of Istanbul from 17th century architecture is one of the principal adornments on the skyline of Istanbul. Also famous for its blue tiles and 6 minarest. Hippodrome : The former center of sprotive and political activities of Constantinople. You will be able to see the Obelisk from Egypt, Serpentine Column from Delphi and fountain of Willhelm II.